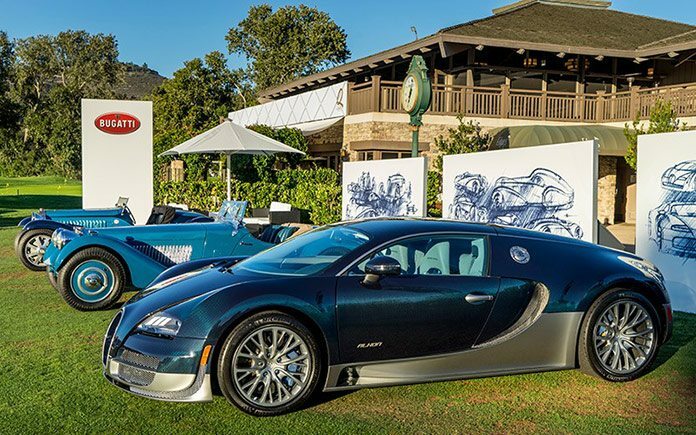 Bugatti is set to stage a parade of special vehicles from its history as part of this year’s Monterey Car Week. The French luxury brand presents two record holders at the prestigious automotive events “The Quail, A Motorsports Gathering” on Friday and “Pebble Beach Concours d’Elegance” on Sunday. The first is the Type 35, which is the most successful racing car of all time with nearly 2,000 victories and podiums. The second is the Veyron 16.4 Super Sport, which drove 431.072 km/h (268 mph), making it the fastest production car in the world. Another two exceptional examples of Bugatti’s super sports car heritage will also be included: a Type 57SC Roadster and a Type 55 Super Sport Roadster. 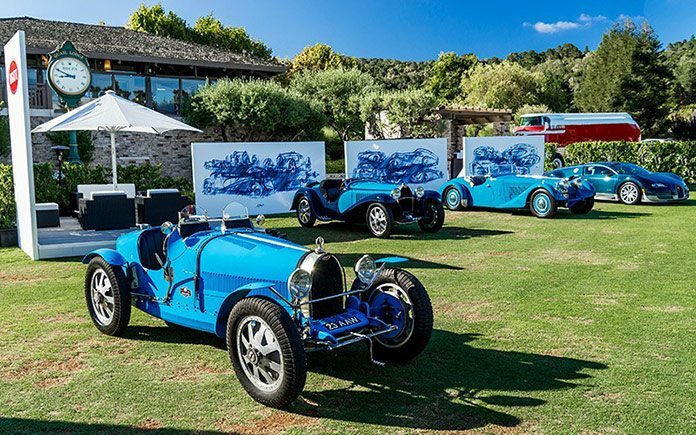 The French car maker’s attendance at this event underlines its commitment to the ideals of company founder Ettore Bugatti, which finds a modern interpretation in the brand values of “Art, Forme, Technique”. In keeping with tradition, all vehicles will be exhibited in blue, the historic racing colour of France. 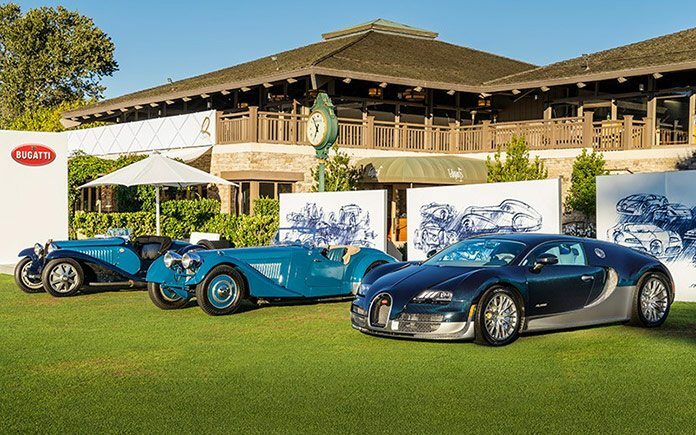 Bugatti has also shown its commitment to preserving the Veyron’s status as a coveted collector’s item and investment through the “Bugatti Certified” program. Bugatti successfully completed the first chapter of its recent history with the sale of the 450th and final Veyron earlier this year. When Bugatti introduced this vehicle full of superlatives a decade ago, it created a new vehicle segment. Never before had there been a production sports car with more than 1,000 horsepower under the hood and a top speed in excess of 400 km/h (248 mph). Bugatti currently holds two world speed records, one for the fastest production car at 431.072 km/h, set in 2010, and another for the fastest production roadster, which reached 408.84 km/h (254 mph) with its roof down in 2013. The market segment that Bugatti created was also new, because the starting price of €1 million was a real sensation at the time. The average price of the vehicles sold to date was €2.3 million. Bugatti launched the “Bugatti Certified” program in 2014 as a way to provide a full service for owners of a new or used Veyron. This includes the technical inspection and preparation of vehicles, technical updates and an extended warranty of at least one year. With the “Bugatti Certified” seal, the vehicle owner is not only guaranteed visibly and technically flawless condition of the vehicle, but also the certainty of having contributed to the long-term value of the car. Bugatti has undoubtedly brought a highlight of its history to Monterey in the shape of the Type 57SC Corsica Roadster (chassis 57531). The two-seater roadster, whose body was engineered by renowned French company Corsica, belonged to Sir Malcolm Campbell, who played a key role in co-designing the body and took ownership of the car on 22 April 1937. The model is the sporty version of the standard Type 57 touring car and was launched at the Paris Motor Show in 1935. The chassis was 32 cm shorter and sat lower, the “S” in the model name stands for “Surbaissé”, which is French for “lowered”. The “C” stands for “Compressor”. As a successor to the Type 55, the last of which was delivered in July 1935, only 43 Type 57S vehicles were manufactured until production ceased in 1938. The most interesting detail of this car was undoubtedly the rear axle, which passed through the chassis rather than riding under the longitudinal frame members, as in the standard Type 57. The front axle was also new. It was split down the middle and can be considered a precursor of front single-wheel suspension. In terms of powertrain technology, the S-versions differ from the standard versions as the 57S engines have dry sump lubrication. Instead of a standard coil ignition with a vertical distributor, a Scintilla magneto driven by the left camshaft was housed in the bulkhead. The Type 57S engine also had a higher compression ratio of 8:5:1 rather than 6:7:1, resulting in greater power. With a displacement of 3,257 cm3 at 5,500 rpm, the engine delivered an impressive 170 PS. The top speed was 200 km/h, which was extremely impressive for a roadster at the time. The car nicknamed “Bluebird” has been in the possession of a Californian car collector since October 2002. 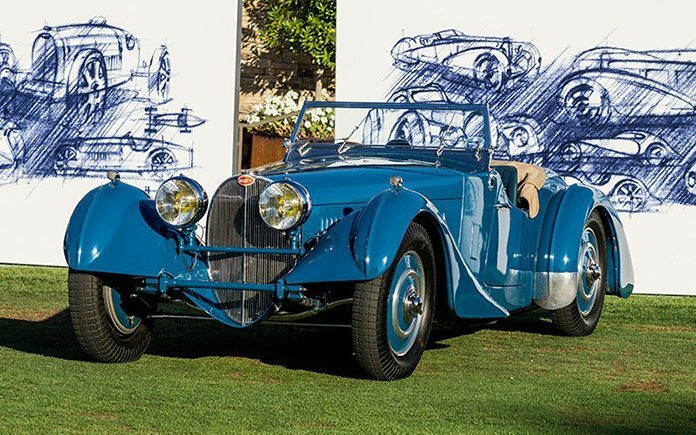 Bugatti will also be showcasing a Type 55 Super Sport Roadster (chassis 55208) at the Pebble Beach weekend. The Type 55 succeeded the Type 43 in 1931 as a touring car with a Grand Prix engine. Ettore Bugatti used the relatively lightweight Type 51 engine and the extremely rigid chassis from the Type 47, which was capable of holding a heavy engine. In the process, he combined the ingredients to create one of the most finely honed Bugatti chassis. The brakes and wheels on the 55 were identical to those of the Type 51. The transmission was carried over from the Type 49, but the Type 55 had a newly developed housing featuring long cantilevers mounted on the side members to further increase the rigidity of the chassis. The acceleration of the Type 55 was impressive, taking less than ten seconds to get from 0 to 100 km/h. At 5,500 rpm its 10-cylinder engine achieved a solid 135 PS. This vehicle is still considered to be an unbeatable combination of Grand Prix racing car performance with the luxurious and comfortable driving characteristics of a touring car. A total of 38 Type 55s were built between 1932 and 1935, of which 28 are still in existence. The displayed chassis 55208 was ordered by Parisian Bugatti agent Dominique Lamberjack in February 1932 and delivered in April of the same year. The buyer was the amateur racing driver Charles Brunet, who commissioned a “Roadster Luxe” body by coachbuilder Georges Gangloff and actively competed in races with it. The vehicle has been in the possession of the Mullin Automotive Museum in Oxnard, California since 2012. The third vehicle in the Bugatti parade is a Grand Prix racing car in its purest form: a Type 35 from 1926. With over 2,000 victories and podium positions, the Type 35 is one of the most successful racing cars in automobile history. Between the mid-1920s and 1930s, it won all the major races, including five consecutive victories in the Targa Florio, which was the toughest road race in the world at the time. 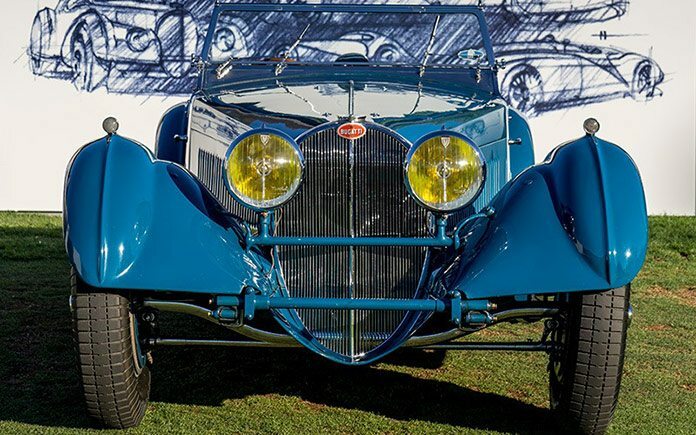 In keeping with the philosophy of “Race on Sunday, sell on Monday”, company founder Ettore Bugatti sold countless Type 35s directly to wealthy customers following successful race weekends. This business idea brought commercial success for the Molsheim car maker. In its time, the Type 35 was the only car that could be driven both on the race track and on the roads. The Type 35 is powered by a 120 PS 2.3l in-line eight-cylinder engine. Its 750 kilogrammes are distributed perfectly across the axles (50 to 50 per cent), giving the car incredible dynamics. The vehicle on display in Monterey comes from the car manufacturer’s own archive. Bugatti will also showcase the Veyron 16.4 Super Sport, the youngest member of the super sports car range. The car was manufactured at the company’s historic Molsheim headquarters in 2011. In 2010, the 1,200 PS Super Sport set a world record for the fastest production car with a top speed of 431.072 km/h, and remains unbeaten to this day. 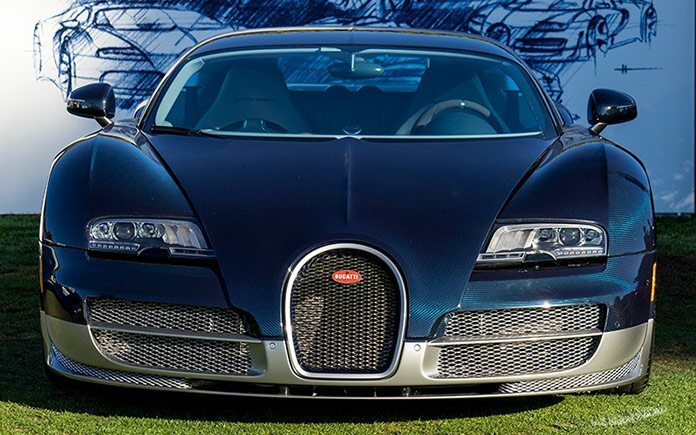 The Veyron 16.4 Super Sport is the 1,200 PS derivative of the 1,001 PS Veyron 16.4, which marked the beginning of Bugatti’s most recent success story in 2005. Only 450 Veyrons were built, of which 300 were coupés and 150 were roadsters. As of the start of this year, all vehicles have been sold. No other automotive manufacturer has previously managed to sell an exceptional vehicle of this kind in a comparable price/volume range. The development of the Veyron was one of the most significant technical challenges ever undertaken by the automobile industry. It was the first production car with over 1,000 PS, the first to exceed 400 km/h and accelerate from nought to one hundred km/h in less than three seconds – while remaining suitable to drive to the opera in comfort and style in the same configuration. Even ten years after it was launched, the Veyron is a superlative in every respect. When developing the Veyron, the designers also strove to continue the aesthetic tradition of Ettore Bugatti. And they certainly succeeded. The exterior has a modern style which incorporates Bugatti’s classic design features. The Veyron is an example of timeless automotive design and at the same time an automotive work of art. The vehicle shown here is on loan from a customer in the USA.